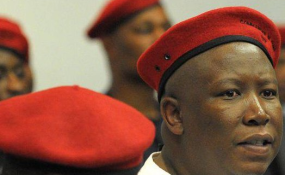 SOUTH African opposition Economic Freedom Fighters (EFF) leader has called on his government to bail-out stricken northern neighbour Zimbabwe. He was however, quick to slam the Harare government's heavy-handedness in dealing with dissent. Malema told a press briefing Wednesday that regional block SADC must set up a fund to help Zimbabwe turn around its economic fortunes, arguing the country's problems are a threat to regional stability. "Zimbabwe must be helped. Anyone who refuses Zimbabwe a bailout is dumb," said the fiery politician. "If we don't help Zimbabweans, the border is going to be flooded by them. Anyone who is going to block them from coming into South Africa, we are going to fight. "You are always complaining about the presence of Zimbabweans, the only way not to have them is by helping them in their country. "SADC countries must give a conditional grant dedicated to developmental programs which must not end up in the hands of Zanu PF politicians. "A weak Zimbabwe leads to a weak SADC. The little we have as Africans we need to share." Millions of Zimbabweans have fled the country's economic and political meltdown in the last two decades, many finding refuge in South Africa as well as other countries. Malema warned that, left alone, Zimbabwe would be at the mercy of international multi-lateral institutions as well as fast developing China. "Otherwise we are setting up Zimbabwe for IMF and World Bank bailouts or even the hostile Chinese. You know what that means," he said. "Let's not put Zimbabwe under that situation. We are Zimbabwe and Zimbabweans are us. Their problem is our problem." However, while joining South African President Cyril Ramaphosa's recent call for sanctions removal, Malema said President Emmerson Mnangagwa's decision to block the internet was unacceptable. "Mnangagwa shutting down the internet, not allowing people to protest is barbaric," he said. "It's backward. We don't care about Zanu PF and Mnangagwa must know it's unacceptable. "We want to help Zimbabwe and we will ant the sanctions gone. "But we will not support the tyranny and brutalization of our people." The EFF leader has been consistent in his call for stability in Zimbabwe as well as the removal of sanctions. He insists that his party does not buy into local opposition calls for foreign assistance to force Zanu PF out of power.